When you plant Asiatic lilies in a home flowerbed, you can enjoy a bounty of beautiful blooms in a wide assortment of colors. Although Asiatic lilies are not strongly scented, what they lack in scents they more than make up for in striking blossoms. If your Asiatic lilies are top-heavy and their blooms threaten to pull the entire flower over to the ground, stake Asiatic lilies to provide necessary support. Push a bamboo stake into the soil with your hands approximately 3 inches from each stalk. As you place the stake into the soil, be extremely conscious of the depth of the bulb and stop inserting the stake before it gets near the bulb. Make each stake at least 4 feet above the soil level so it can adequately support the lily when it reaches full height. Cut 10-inch lengths of twine. You need one length of twine for every Asiatic lily you are staking. Tie the twine around the stalk of the plant and the stake. Position the twine loosely around the lily, 1 or 2 inches below the blossom. Do not tie the twine so tightly that it injures the plant stem. Watch the lilies as they grow throughout the growing season. 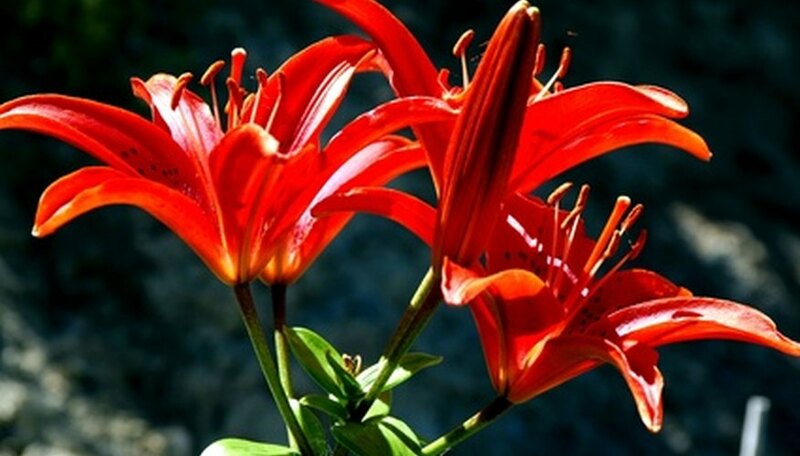 As the lilies reach full height and prepare to blossom, you may need to tie a second piece of twine around the lilies to support the heavy blossoms. Tie these pieces of twine in the same fashion as you tied first pieces of twine. Remove the stakes and the twine from the lilies when the flowers fade and the plants wither after blooming. Reserve the stakes for future growing seasons. Bamboo stakes make ideal stakes for supporting lilies because they are easy to install and strong enough to support the lily blossoms. If you can find green bamboo stakes, the stakes will blend in with the Asiatic lilies and you may not even notice the stakes in the flower garden.